The "Shieldhall" is a Heritage ship included in the National Historic Ships Core Collection and is generally recognised to be the largest working steamship of her type in Britain and probably Europe. The ship was laid down in October 1954, launched 7th July 1955 and entered service in October of that year. Built by Lobnitz & Co., of Renfrew, she is of special interest as she was built on older classic lines with a traditional wheelhouse, of riveted and welded construction with a straight stem and a cruiser stern. 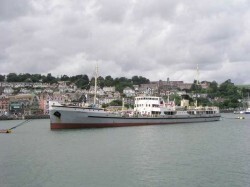 As a result of an initiative by the Southampton City's Museum Services, a preservation society was formed and "Shieldhall" was purchased from Southern Water in 1988, for £20,000. The Society is registered as an Industrial and Provident Society as The Solent Steam Packet Limited and operates as a charity. She is now the largest working steam ship in Northern Europe. During the summer months, excursions are normally run in the Solent area and during the course of these voyages, passengers are encouraged to visit the Bridge and machinery spaces. "Shieldhall" makes a special venue for the very special occasion. On board "Shieldhall", we can satisfy the needs of the avid steam enthusiast as well as those who like comfortable surroundings and good food in a unique environment. Whatever the event, our guests are welcome to visit the bridge and engine room. Work has been completed on essential repairs and "Shieldhall" regained her passenger certificate in time for a successful 2012 sailing season. Private cruise "Shieldhall" offers cruising with the silky smoothness of steam. We don't hurry as we wish our passengers to enjoy the relaxing effect and the wide open deck spaces. For cruising, we now take up to 200 passengers. Special Functions We are always pleased to consider requests for wedding receptions, special celebrations, or use by Clubs and Societies. Conference Facilities "Shieldhall" offers a unique facility to companies and institutions that require a completely different venue. The Solent Steam Packet (Services) Ltd.